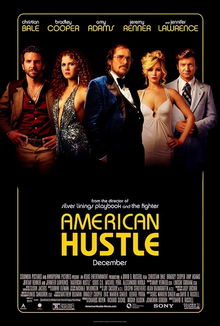 The word “real” turns up throughout David O. Russell’s latest film, American Hustle. Characters repeatedly talk about “real love,” “real business,” “real friends,” and so on. The irony, of course, is that it is a movie about con artists — that is to say, fakes. Thus the film is always more than a mere caper story; it is an exploration of the difference between real and fake, between authenticity and forgery. Indeed, this theme is implied from the outset: the movie begins with its lead character, Irving Rosenfeld (Christian Bale, in a brilliant, self-effacing performance), fixing his toupee with painstaking care. Rosenfeld, then, is identified as a fake. What you see is not what you get. As we soon learn, he is a small-time conman, who, along with his lover and partner-in-crime, has been forced by the FBI to facilitate a series of cons. The goal is to bust several political leaders who are profiting from efforts to revitalize the casino industry in New Jersey. Rosenfeld provides the bait, while the FBI reels in the fish. It is a straightforward sting operation, but there is a problem: human beings, it turns out, have an innate desire for truth, for the real. Rosenfeld comes to admire and even to befriend one of the politicians — Carmine Polito (Jeremy Renner), who genuinely wants to benefit the hardworking people of his state. Richie DiMaso (Bradley Cooper), the FBI agent heading up the racket, falls in love with Rosenfeld’s mistress, Sydney Prosser (Amy Adams). But Prosser’s provocations are merely a means of distracting DiMaso, since she truly loves Rosenfeld and remains hopeful that they will run away together when the operation is over. Meanwhile, Rosenfeld’s wife, Rosalyn (a volatile Jennifer Lawrence), is a hot-blooded, chain-smoking neurotic, who nevertheless demands that someone — anyone! — love her just the way she is. Even when we’re faking it, the movie suggests, we still want something real. But what, finally, is real? Russell is clear that the answer does not lie in institutions. After all, the FBI is, ostensibly, in the business of doing good, and yet, as Rosenfeld points out, the politicians they nab are not so much real bad guys as middle-men looking to make a buck while helping their constituents. Nor does the answer lie in unlimited freedom, for, it seems, an undefined freedom is precisely the trouble — a temptation to put on various masks, to play parts, when what the self most profoundly desires is transparency, openness. Rosenfeld himself ultimately realizes this when Polito, a devoted family man, pays the price for a crime he didn’t want to commit. In a moment of rage, he curses his false friend. Soon after, Rosenfeld crumples to the ground, fumbling in his pockets for — in a repeated double entendre — his “heart pills.” In a movie of ostentatious style, it is a moment of quiet poignance. In the end, then, Russell points us beyond the con to what is real or, at least, to the search for what is real in a world of fakes. This is a search that characterizes so much great art. Yet, more than that, it also occupies a central place in Christian thinking. From St. Paul and Augustine of Hippo — Christianity’s original con men, so to speak — and on to Kierkegaard and his critique of the aesthetic, the self’s ongoing quest for authenticity is a Christian theme par excellence. Russell simply dresses it up in polyester and gives it a hell of a soundtrack to boot.